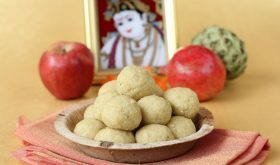 Atukula Laddu is a simple and easy to make festive sweet that is prepared in many homes for Sri Krishna Jayanthi festival. Beaten rice or flattened rice flakes is a popular ingredient that is used to prepare many varieties of savory and sweet dishes for Janmashtami. 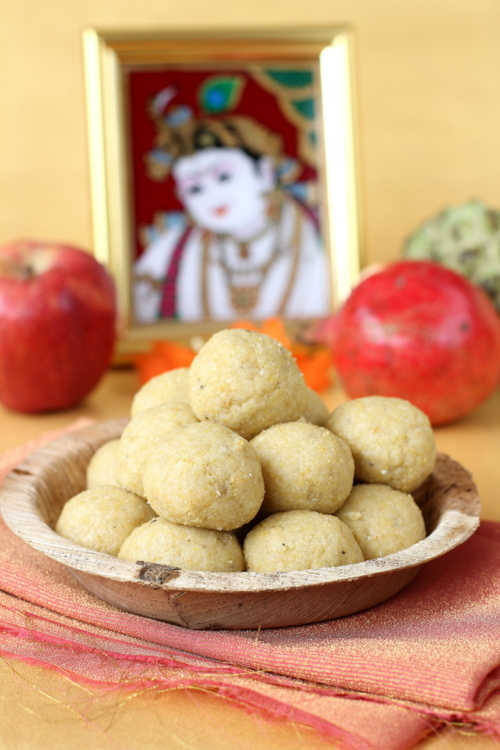 There are numerous variations to the Atukula laddu recipe which is also known as Atukula Unda/Vundalu in Andhra. A popular variation is the additon of dry coconut powder, roasted chick peas (dalia) or peanuts and jaggery. Today, I am posting a slightly different version of the beaten rice recipe which calls for yellow moong dal, vermicelli and powdered sugar. These laddus can be stored upto a month in an air tight container. Just ensure that you grind all the ingredients to a very fine powder before forming the mixture into laddus. In a heavy bottomed vessel, dry roast beaten rice on low flame for 4 mts. Remove to a plate and cool. In the same vessel, add vermicelli and dry roast for 4 mts on low flame. Remove to a plate and cool. In the same vessel, add moong dal and dry roast on low flame for 4 mts. Remove to a plate and cool. Grind each of the three roasted ingredients to a fine powder and keep them each in different bowls. Do not mix them. Heat a tsp of ghee in the vessel, add the ground vermicelli and roast on low flame for 2 mts. Remove to a plate. In the same vessel, add 1 1/2 tsps of ghee and add the ground moong dal. Roast on low flame for 2 mts. Remove to a plate. In the same vessel, add 1 1/2 tsps of ghee and add the ground beaten rice. Roast on low flame for 2 mts. Remove to a plate. Mix all the three roasted ground powders in a wide plate. Add the roasted nuts, caradamom powder and powdered sugar and mix well. Slowly add the warm ghee and mix well. Shape into small laddus. If you have difficulty in shaping laddus, add more ghee and make laddus. Store in air tight container upto 3 to 4 weeks. Vermicelli is optional. If you omit it, increase beaten rice by 1/3 cup. Or use oats instead of vermicelli. Ensure you roast all the ingredients on very low flame. Do not burn them. Grind the vermicelli to a very very fine powder, if using it. By Sailu Published: August 27, 2013 Atukula Laddu is a classic beaten rice (flattened rice flakes) recipe prepared as part of Sri Krishnashtami festival sweet dishes. Simple and tasty mithai. I think it is an Indian dish as i remember it when i was on travel to India. I become aware of the fact that it is prepared on festivals in India. Tried the recipe, came out very ell, this is the first time am making any laddoos, Thanks a lot for sharing this recipe sailu garu. Hi, Sailu can i use powdered sugar? Hi Sailu! How about Splenda or sugarfree instead of sugar! Diabetic but need to do something for festival! May I also use fresh coconut! my family liked it so much that i had to make it thrice !